There’s a particular sound a large audience makes when it includes toddlers and babies. That was the atmospheric back drop to the debate on H&F Council’s budget last night. Sadly, the pertinence of it appeared lost on the Conservative Councillors who jeered and cheered as they were asked to justify their cuts and spending priorities. The public gallery was packed with a wide range of local people who will be affected by the £33 million of cuts this year. Severely disabled people; the elderly; children; environmentalists and concerned citizens sat side-by-side to hear the justifications for such a draconian approach to front line services. Central government had cut its grant to Hammersmith and Fulham by 11.3%. On the Daily Politics programme, Andrew Neil had said that Mr. Cameron was taking a “sledgehammer to local government.” But H&F Conservatives have long been celebrated in Tory circles for being in the vanguard of the cuts agenda. So their “sledgehammering” included an extra 3.7% whack removing a whopping 15% from the Borough budget. But some things were being protected. The Council spends £5 million on what one Tory MP called “political propaganda on the rates.” They admit to spending £1.8million on consultants - with the Mail on Sunday pointing out that this Conservative Administration employs the, £310,000.00 a year, highest paid of all “taxpayer-funded fat cats.” They are wasting £35 million on new Town Hall offices and failed to maintain the momentum set on debt repayments when the market was right. Indeed, the TaxPayers’ Alliance criticised the 16% salary rises they gave to senior bureaucrats. And, when you consider that this Conservative Administration admitted wasting £250,000.00, because they could never get around to turning the lights off in the Town Hall extension, it is questionable how genuinely thorough they have been in tackling their budget predicament. My Labour colleagues and I have long called for a different approach. But the public were there to plead for their services. A staggering £4.279 million was sliced from the home care budget for the Borough’s elderly, sick and disabled residents. That will mean many will be left with no service whatsoever. Others will be charged inflation busting hikes in charges – which last time caused the Council to admit it had put lives at risk. One disabled woman became so upset that she cried out, mid-debate, that they were “cruel!” The response was swift. The Tories nodded in the direction of officials and security guards carted her off before she could tell more truth to power. The Administration cut £1 million to the children’s service that is meant to stop child abuse. I asked Administration Councillors if they would guarantee that this would not put any child at any greater risk. They refused to answer. Sure Start was closed down in all but name as £3.4 million was removed with the vast majority of families soon to be turned away from a service that's proved critical to children’s long term education. Parking rates have been hiked by over 55% and over five hundred stealth taxes were increased by a minimum of 6%. The Conservatives claimed that they are protecting front line services for "vulnerable people" but that evidently isn't true. Just look at the summary of some of their cuts below. Click here for a link to the budget papers. My Labour colleagues and I voted against this budget. There are things we support such as the zero setting of Council Tax but the Conservatives have had long enough manage our finances. The incompetence of their approach and wasting tax payers’ money on the wrong priorities is hard to stomach in itself. Consider who is paying the price for this and it's easy to understand the highly charged sentiments of those residents that turned up. Clearly feeling under pressure the Conservatives retreated to what is now their hackneyed phrase about the national economic situation. But the fact is the Conservative led government’s approach is coming in for much international criticism. Writing in the New York Times, Nobel Prize winning economist Paul Krugman asked “Why is the British government doing this? The real reason has a lot to do with ideology: the Tories are using the deficit as an excuse to downsize the welfare state.” Brad DeLong, another American economist, took the highly unusual step of saying the Cameron led government are "clueless dorks." The latest 0.6 shrinkage in the UK economy combined with increasing levels of inflation indicates that we could well be heading towards Japanese style stagflation George Osborne was warned about when he unveiled his economic plans. 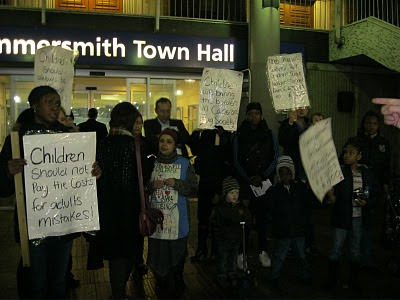 I predict the government will be forced to change course as the next election approaches but not before we see terrible youth unemployment blighting a generation and the misery these economically illiterate policies being bourn by many of the people packed into Hammersmith Town Hall last night. H&F Conservatives had done everything they possibly could to deny any proper scrutiny of their budget prior to this meeting. And, far from defending Hammersmith and Fulham’s residents from the government’s highly ideological cuts our local Conservatives “were on the sidelines clapping and cheering.” I put that to them at the meeting. Afterwards, a resident came up to me and said, "You only had to look at the smirks on their faces to know how true that was." Sadly, I think she had got that just about right.